Most of the books I've read so far about self organising systems and artificial life have tended to be mathematics based (fractals, measure theory, ...), or biology based (DNA, amino acids, genetic algorithms, ...). This one in firmly in the physics camp (statistical thermodynamics, entropy, ...). It does require an understanding of these concepts. There is a good description of statistical information theory and entropy, emphasising that information is always measured with respect to something. An evolving string encodes information about its environment; put it in a different environment, and the information disappears. (Jack Cohen would appreciate this point: he is always emphasising that the information is not "all in the DNA", but that the environment is which the DNA is expressed is just as important.) How the environment is encoded in a string is well explained. The book presents a good mix of theoretical and experimental results. It comes complete with a CD-ROM of avida, a tierra-esque artificial life system, so readers can pursue their own experiments, evolving strings of instructions, and imposing selection criteria. Also, most of the experiments are conducted on static fitness landscapes, where the fitness is determined solely by the 'artificial chemistry' as captured by the meaning of the alife code instructions, and an externally imposed fitness function, such as being able to calculate an arithmetical result. There is only passing reference to co-evolution, where the rest of the population affects the fitness landscape (if your food source goes extinct, you could do so, as well). However, one aspect I did like was the idea of a fractal fitness landscape, which, as you look more closely, always has new peaks, new ways of going uphill. There is no global optimum in such an infinite landscape, hence no idea of having reached "perfection", or the pinnacle of evolution. So all in all, I would say this is a good introduction from one perspective only, that of conditional information and entropy, but is by no means a full introduction to the subject. Christoph Adami, Richard K. Belew, Hiroaki Kitano, Charles E. Taylor, eds. 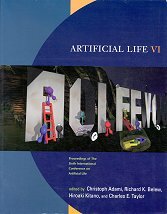 Artificial Life VI: proceedings of the sixth international workshop on the synthesis and simulation of living systems, UCLA.